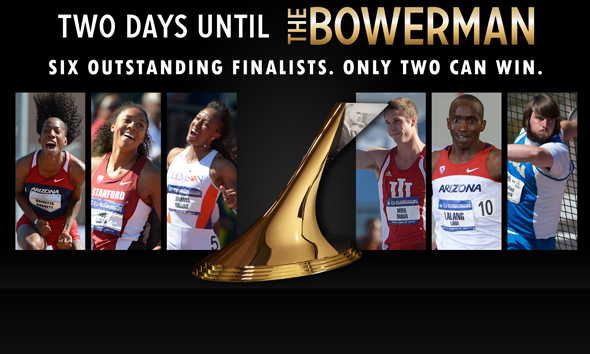 ORLANDO, Fla. – The countdown to the presentation of The Bowerman Trophy to the most outstanding male and female collegiate track & field student athletes of the 2012-13 is down to just two days. One of three male finalists and one of three female finalists will be handed the iconic The Bowerman Trophy during the award show on Wednesday, Dec. 18, beginning at 7 p.m. ET from the JW Marriott Orlando Grande Lakes in Orlando, Fla.
Flotrack.org will be broadcasting the presentation live, beginning with the Red Carpet Show at 6:30 p.m. ET. Red Carpet Show hosts Ryan Fenton and Alex Lohr of Flotrack will greet women’s finalists Brigetta Barrett of Arizona, Kori Carter of Stanford and Clemson’s Brianna Rollins as they enter the presentation, along with men’s finalists Derek Drouin of Indiana, Lawi Lalang of Arizona and Julian Wruck of UCLA. Each of them will enter the Mediterranean Ballroom as finalists, but only one man and one woman will leave it as The Bowerman winners. Will it be Barrett, the newly minted collegiate high jump record holder, who claims The Bowerman in her second consecutive trip to Orlando as a finalist? Her undefeated season against collegians in the high jump included two NCAA individual titles, giving her six national crowns in her career. Will one of the two women’s hurdlers claim The Bowerman? Carter defeated 2012 Olympic 400 meters finalist Georganne Moline of Arizona five times, including in collegiate-record fashion at the NCAA Championships to claim the national title. She also finished runner-up in the 100 hurdles at the NCAA Outdoor Championships. The woman who defeated Carter in the short hurdles final was none other than fellow finalist Rollins, who notched three collegiate records in 2013: the indoor 60 meter hurdles and twice the outdoor 100 hurdles. She re-wrote the collegiate record book and added national titles in both events for good measure. On the men’s side, will high jumper Drouin become the first-ever The Bowerman winner from the Big Ten? An Olympic bronze medalist a year ago, he had to overcome silver medalist Erik Kynard of Kansas State to claim both the indoor and outdoor NCAA titles and scored numerous top-10 all-time marks. Will distance star Lalang win The Bowerman after an unprecedented championship season? He became the first man to win indoor mile and 3000 meters titles and outdoor 5000 and 10,000 meters titles in the same academic year. Or will the men’s trophy go to Wruck, who was untouchable in the discus this year en route to his second NCAA title? He owns the all-time farthest collegiate throw with his performance at a pre-NCAA exhibition, recorded numerous official all-time top-10 marks and hoisted the 27 best collegiate marks of 2013. Continue reading below for more details about each of the finalists, and tune in LIVE on Flotrack.org at 6:30 p.m. ET to find out the answers to these questions for yourself. High Jump | Wappingers Falls, N.Y.
Barrett claimed the NCAA Division I high jump crown at both the indoor and outdoor championships, placing capstones on a season that saw her go undefeated against collegians in ten competitions en route to a new collegiate record. Her winning jump of 6-6¼ (1.99m) at the Pac-12 Championships broke the previous outdoor collegiate record of 6-6 (1.98m) held by Amy Acuff of UCLA and Kajsa Bergqvist of SMU. She also toppled Acuff’s dual meet record by a centimeter with a leap of 6-4¼ (1.94m) at the Arizona-Arizona State-Northern Arizona tri-meet. Carter became a hurdling force to be reckoned with not only at the collegiate level but also on the world stage during her 2013 outdoor campaign, winning an NCAA Division I title in the 400 hurdles in a collegiate-record 53.21 and finishing runner-up nationally in the 100 hurdles in 12.79 — both against some of the best competition the world has to offer. She defeated 2012 Olympic finalist Georganne Moline of Arizona — who finished fifth in the 400 hurdles in London — in each of their five meetings, including both rounds of the NCAA Finals. Rollins ended her final year at the collegiate ranks the exact same way she started it: with a collegiate record. The Tiger hurdler set the collegiate record in the indoor 60 hurdles in her very first final of the season with a blazing 7.78 and ended her campaign with the 100 hurdles collegiate record outdoors at 12.39 (+1.7m/s) en route to an NCAA Division I title in the event. Her outdoor record came at the expense of the collegiate record of 12.47 (+1.2m/s) she had set two days earlier in the prelims. In total, her season featured five of the ten fastest times in collegiate history in the 60 hurdles; three of the seven fastest 100 hurdles all-conditions time in collegiate history; and an unbeaten streak of 17 races between the two events. It was a banner year for Drouin — the indoor and outdoor USTFCCCA Indoor and Outdoor National Field Athlete of the Year — as he became the first to sweep both the indoor and outdoor NCAA Division I high jump titles in one academic year since he last did so in 2010. The Canadian won at heights of 7-8 (2.34m) or greater and took cracks at collegiate records at both championships. He finished unbeaten in nine collegiate high jump finals between indoors and outdoors, with his only overall loss coming in a tie with fellow The Bowerman semifinalist and rival Erik Kynard of Kansas State at the Nike Prefontaine Classic Diamond League Meeting, where both posted the No. 2 outdoor mark in collegiate history at 7-8¾ (2.36m). Though Lalang did not compete as frequently as the other Finalists due to the nature of his events, he made every race count with four NCAA Division I individual titles — two indoors and two outdoors — two NCAA DI Indoor Championships records, four all-time collegiate top-10 marks indoors in two different events, and a 2013 collegiate-best at 1500 meters, an event he elected not to run at the NCAA DI Outdoor Championships. He swept both the mile and 3000 meter races at the indoor championships and took both the 5000 and 10,000 meter events at the outdoor championships, joining 2009 The Bowerman winner Galen Rupp of Oregon and Suleiman Nyambui of UTEP in 1982 and ’83 as the only male runners to win four individual NCAA DI distance titles in one academic year. A national contender and 2011 champion in the discus in his days at Texas Tech prior to his transfer to UCLA, junior Julian Wruck had a breakthrough year in a big way in 2013, re-writing the record books en route to his second NCAA title in the discus. He finished the season not only undefeated but nearly untouchable in eight collegiate events in 2013, registering the top 27 throws by any collegian in 2013. He officially owns four of the top 10 throws in collegiate history and is No. 4 all-time at 217-7 (66.32m), and produced an all-time collegiate best 223-7 (68.16m) mark at an exhibition throws meet among four other throws that would have ranked in the all-time collegiate top-10. Southern Utah’s Cam Levins and LSU’s Kimberlyn Duncan are the reigning winners of The Bowerman, which is named for legendary Oregon track & field and cross country coach Bill Bowerman. Past winners include Olympic gold medalist, World Champion and decathlon world-record holder Ashton Eaton (2010), 10,000-meter Olympic silver medalist Galen Rupp (2009), and 2011 IAAF World Champion at 1500 meters, Jenny Simpson (2009). In total, the winners from the award’s first four years have won two Olympic Medals, two World Championships and six World Championships medals. When considering finalists for the award, 13 individuals have earned a combined six Olympic medals, four World Championships and 17 World Championships medals.